The government initiative to put the history of Jews of Arab countries - along with the circumstances under which they came to Israel - on the public agenda has aroused anger and opposition. Palestinian dignitaries, among them Hanan Ashrawi and MK Ahmed Tibi, claim that raising this issue is an outrage. They have been joined in the pages of this newspaper by Gideon Levy ("How many homelands do the Israelis get to have?" September 20 ) and Yifat Bitton ("Another way to discriminate against Mizrahim," Hebrew edition, September 20). This opposition comes as no surprise, because the history of the Jews of Arab countries shakes to the core the worldviews of these opponents, and the truths upon which they formulated their political stance. Long before Zionism came on the scene, the Jews lived under Muslim rule in the Middle East and North Africa as an exposed and vulnerable minority. They were considered wards of the state, and as such, paid a special tax. Their lives and property were protected officially, but in return they were forced to tolerate various forms of legal and social discrimination. An exhibition about the Jews of Algeria that is currently on display at the Museum of Art and History of Judaism in Paris offers the testimony of an Italian visitor to the city of Algiers in 1811: "There is no species of outrage or vexation to which [the Jews] are not exposed ... They cannot ride on horseback, but are obliged to go on mules and asses; the first being too noble an animal for them... Their clothing is obliged to be black; which colour is held in contempt by the Moors... The Moor [...] calls any Jew who is passing, and makes him perform the offices of a servant. Others amuse themselves by smearing the hands, visage, hair, and clothes of the Jewish boys, with paint or mud." 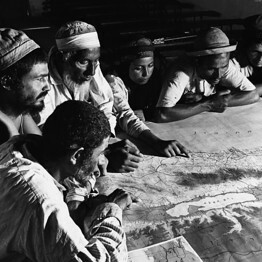 Starting in the 1940s, the situation of the Jews in Arab countries deteriorated greatly. In 1941, 150 Jews, among them babies, were murdered in a two-day pogrom (the Farhud ) in Baghdad. In November 1945, 133 Jews were murdered, and hundreds were injured, in Tripoli, Libya. In 1948, dozens of Jews were murdered in a long series of attacks in Egypt's major cities. At the same time, Arab governments ordered the nationalization of Jews' property, freezing of bank accounts, and mass dismissals from employment. This policy made no distinction between Zionists and non-Zionists; it did not separate those who hoped to stay in the places where their ancestors had lived for centuries from those who were glad to emigrate. Of approximately 850,000 Jews, there are only a few thousand left today in Arab countries. Zionism, then, is not a Western colonial project, but is, rather, a response to the situation of Jews who were born in the Middle East and lived there even before Islam came along. All these facts bolster the need for a Jewish nation-state, and greatly weaken the argument concerning the supposed utopia that awaits us all in a binational state, or if the demand for Palestinian refugees to return to Israel is fulfilled. How very strange is the position of those in civil society in Israel, who deem themselves enlightened and are quick to take an interest in the fate of refugees all over the world, yet turn their backs on the pain of about half of the country's population. They turn their backs on the pain of Janet Dallal, whose father was jailed and tortured in the 1970s by the Iraqi secret service in Baghdad, and since then has been incapable of describing what he went through; they turn their backs on Ada Aharoni, whose father suffered a heart attack a few days after he was expelled from Egypt in 1949, when he found out that the local authorities had frozen his bank account and left him destitute; they turn their backs on Yom Tov Assis, who remembers how in 1947 he closed the shutters at home in Aleppo in terror, when he heard the mob roaring "Expel the Jews." Gravest of all perhaps is the moral injustice contained in the words of MK Tibi, who asks, "How many homelands do you have?" He turns the tables and places the victim - once again - in the defendant's box. First the Jews of Arab countries were humiliated and discriminated against, and now they have to justify themselves and explain how many homelands they have? When it was, precisely, that they became Zionists? Well, if their lives hadn't been made so miserable, maybe they would have stayed in the place they were born. Instead of looking in the mirror and examining what Arab society did to the Jews, Tibi prefers to blame the victims. Israelis have hardly dealt with this history, and it has remained untold. It isn't "why now?" that we should be asking, but "how come we waited so long?" The Israeli government is now doing its part - albeit belatedly - to place the subject on the agenda. It is high time that civil society, and primarily academia and the media, did their part. Adi Schwartz is an independent journalist and researcher who has published a series of investigations into the Jews of Arab countries. "The greatest moral injustice of all is contained in the words of MK Tibi, he writes: 'how many homelands do you need?'" A question that could well be asked of the folks who rejected 88% of Mandatory Palestine for an Arab homeland, surrounded by another 21 "Arab" political entities.